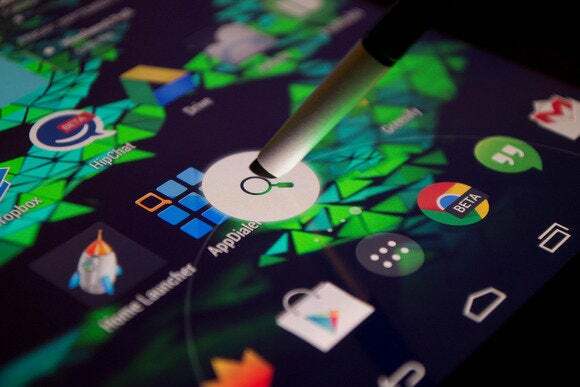 The on-screen navigation buttons on Android devices are usually impossible to alter without root access. The bottom of the screen is not completely off limits in terms of customization, though. All Android devices with on-screen buttons (and even some with physical buttons) have a swipe-up gesture to access Google Now—just run your finger up from the home button on the screen, or the bottom edge of the phone, and Google Now pops up. That shortcut can be customized—you just need to find the right apps to do it. You'll have to set these apps as defaults for this action, so make sure you know how to manage app defaults before delving into this murky area of device customization. The home button is always visible, and the shortcut gesture is hardcoded into the OS. This makes it a great way to access your favorite apps without any of the bugginess you'd see with a lot of gesture-based launchers. Home Button Launcher is a simple app that lets you build a list of your favorite apps--the sort of thing you need access to at all times. Then it attaches that list to the Google Now shortcut. You even get a neat little rocketship icon in place of the Google one. Get quick access to as many apps as you want and even split them into tabs. Your list will appear in a popup just above the navigation buttons. The interface is configurable with multiple tabs, different layouts, and of course, the selection of apps can be changed. If Home Button Launcher does the trick for you, simply set it as the default for the Google shortcut. A few more UI options might be nice, but you can't argue for the low price of free. When things work as intended, Android manages background processes and memory all on its own. Aggressive process management simply isn't necessary on a large scale. There are, however, exceptions to that rule in the case of misbehaving apps. 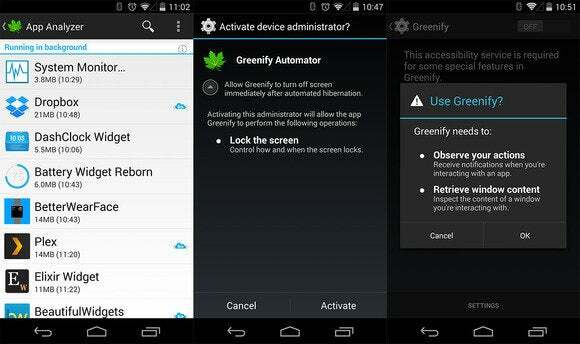 If you have to use a particular app despite its tendency to work poorly, Greenify could save you a lot of annoyance. Hibernate mischievous apps with a swipe, no root needed. This app is designed to kill processes that are triggering wakelocks that drain the battery or cause sluggish performance. Common culprits are banking apps that seldom see updates, ad-supported games, and Facebook. Greenify can do everything in the background with root access, but it's not hard to use even without root—it plugs right into the swipe up shortcut. If you set Greenify to activate when you use the Google gesture, it will need to be enabled as an accessibility service and device administrator. The app will guide you through the process. After that, the gesture will automatically greenify (hibernate) the rogue apps you have flagged and put the device to sleep in one step. What if you want to have access to all your apps in a single place? Well, they call that the app drawer, but what if you want to actually be able to find things? AppDialer harkens back to that era before QWERTY and voice input ruled mobile. With App Dialer, you can filter your app list T9-style with a quick swipe up. Filter all your apps with a T9 keypad. AppDialer is a regular app that you can launch from the home screen, but tying it into the Google Now shortcut is faster and universally accessible. It shows up as a small numeric keypad floating toward the bottom of the screen. Just tap out the first few letters in the name by hitting the corresponding keys. AppDialer filters possible matches so you can launch any app without digging around in the app drawer. The pro version of AppDialer ($4) includes themes and additional actions for filtered apps like uninstall and opening the Play Store page. You can access these options by long-pressing on the app icon. App Dialer also keeps track of your most recent apps so they're easy to get to without tapping any buttons at all. If you don't need constant access to the swipe shortcut, maybe you want it to go away. Some people find that shortcut gets in the way, triggering when they were just trying to interact with a game or app. No problem: there's an app that takes over the swipe gesture and does absolutely nothing. This is one of the few instances I can think of where doing nothing is exactly the intended outcome. Never again will accidentally triggering the swipe gesture pull you away from your app. SwipeLaunch Disabler has to be set as the default for the Google Now shortcut like all the others. The only difference is that when you swipe up on this one, the gesture does nothing. Technically it triggers SwipeLaunch Disabler, and SwipeLaunch Disabler does nothing, but the end result is the same: the shortcut won't get in your way anymore. Greenify does offer this option as well, but it's only worth messing around with that if you want to make use of Greenify's process management features. 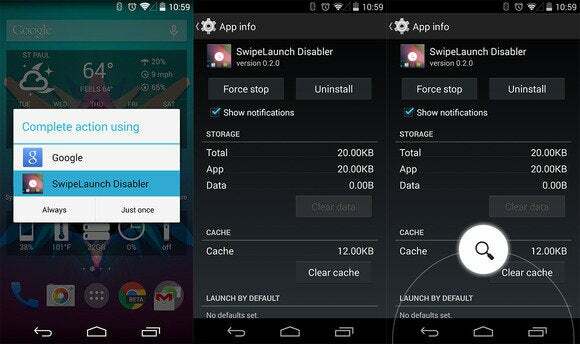 Otherwise, SwipeLaunch Disabler is simpler. Should you decide you want to stop using this or any app, make sure you clear the app defaults in the application manager. Alternatively, you can just uninstall it and set Google at the default once again. 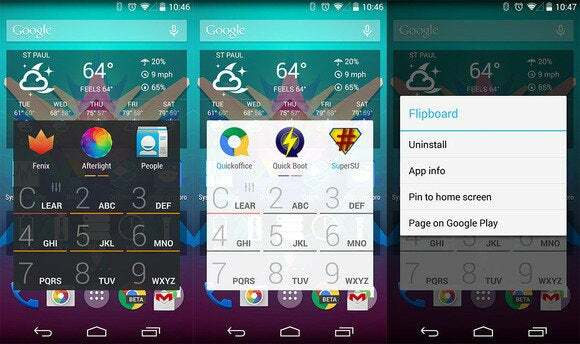 This story, "How to customize the Google Now swipe-up gesture" was originally published by Greenbot.